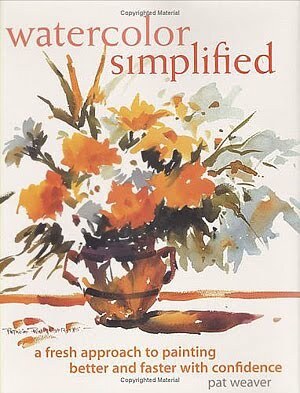 Artists will learn to simplify their paintings by capturing the spontaneous nature of watercolor. Author Pat Weaver shows them how to incorporate her loose, direct painting style into their own paintings, helping them build their confidence and skill. Packed full of clear instruction, Watercolor Simplified shows readers how to mix color directly on the paper to create rich vibrant hues. Weaver then tackles the basics of good painting—composition, drawing, value and color—and teaches them how to easily apply these elements to their paintings. Through 16 step-by-step demonstrations, Weaver shows readers how to capture a variety of subjects, including cats, dogs, people, flowers and buildings. With just paper, pencil and paint, readers will be able to create beautiful paintings that jump right off the page! Pat Weaver is a watercolor workshop instructor nationwide, as well as in England, Italy, France and the Virgin Islands. Her work has been featured in American Artist and Watercolor Magic, as well as in the book Splash 7. She lives in Dade City, Florida.